The Food Allergen Awareness Level 2 training is essential for the whole team. It will give them the knowledge and competence to be able to prepare and serve food that is safe to eat. 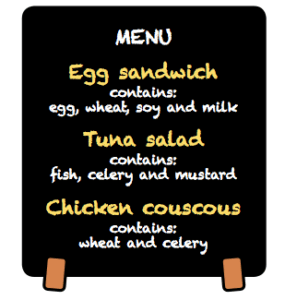 Labeling rules in European Directives 2003/89/EC and 2006/142/EC ensure that all consumers are given comprehensive ingredient listing information and make it easier for people with food allergies to identify ingredients they need to avoid. Training your team in food allergen awareness could make the difference between life, death or serious illness for your customers. Every year there are 4,500 hospital admissions and around 10 deaths from food allergy. New allergen information rules (The Food Information Regulations 2014) are here to change the way you give information on 14 allergens, if included in the food you sell. All successful candidates receive a certificate of training and a copy of The Food Safety Handbook.